The Class 172 is a British diesel multiple-unit (DMU) built by Bombardier Transportation at the Derby factory for use on inner-suburban passenger services in the cities of London and Birmingham for London Overground, Chiltern Railways and London Midland. The Class 172 is of the Turbostar model, similar to the Class 168, Class 170 and Class 171. Class 172/0 - two-car, non-gangway train sets with London Overground for use on the Gospel Oak to Barking Line. Class 172/1 - two-car, non-gangway train sets with Chiltern Railways for use on the Chiltern Main Line. Class 172/2 - two-car, gangway train sets with London Midland for use on the Snow Hill Lines. Class 172/3 - three-car, gangway train sets with London Midland for use on the Snow Hill Lines. The 172/0s and 172/1s resemble the existing Turbostar trains in not having end gangways. These trains have a maximum speed of 100 mph (160 km/h). The Class 172/2s and 172/3s used by London Midland resemble the Class 375, Class 377 and Class 379, Class 387 Electrostars by having end gangways to allow access between units. These trains have a maximum speed of 100 mph (160 km/h). The Class 172s feature BSI couplers which allow them to work in multiple with Class 170 units and most other units with the same coupler. The Class 172 trains are lighter than other Turbostars due to use of the Bombardier FLEXX-ECO bogies - a development of the B5000 bogies used on the Class 220 Voyager DEMU trains, rather than the previous 'Series 3' bogies. Another difference is that they have half-height airdams as opposed to the more standard full height airdams. They also differ from earlier Turbostars in having mechanical transmission rather than hydraulic - gear changes can be distinctly heard as the trains accelerate and decelerate. Class 172 with lightweight bogies. 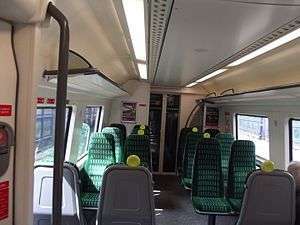 Class 172s have fewer seats than the Class 150s they replace, but greater overall capacity due to the increased room for standing passengers as well as wider aisles intended to speed boarding and alighting and reduce waiting time in stations. The trains are air-conditioned and have no opening windows, unlike the Class 150s. The Class 172 is designed to a 23m body length, as opposed to 20m length used on previous Class 150 Sprinter DMUs - increasing capacity. London Overground Class 172s at Walthamstow Queen's Road. London Overground operates eight two-car Class 172s on the GOBLIN (Gospel Oak to Barking Line), replacing the old Class 150 stock. The units were originally meant to be in service from February 2010, but due to production issues and then what were thought to be exhaust problems (which proved to be a false alarm), the trains entered service only in July 2010; and then at reduced capacity due to staff training problems. By December 2010 the whole fleet was in service, allowing the Class 150s to be cascaded to First Great Western and other operators. The units are leased by London Overground Rail Operations (LOROL), the London Overground concession operator, from a rolling stock leasing company rather than them being purchased directly by Transport for London. The success of London Overground's operation of the Gospel Oak to Barking Line meant that the 2-car Class 172s eventually proved insufficient in terms of capacity. Initially, there were plans to replace them with 3 or 4 car units DMUs. However, subsequent to this proposal, the government announced plans to electrify the GOBLIN, with the intention that TfL will procure a new fleet of 4-car EMUs (Class 710) for use on both this route and the inner suburban routes from Liverpool Street, which was taken over by London Overground from 2015. This electrification is scheduled for completion in June 2017. A London Midland Class 172 at Solihull. London Midland operate a total of 27 two-car and three-car units, originally planning for them to enter service by the end of 2010 on services to and from Birmingham Snow Hill, again replacing Class 150s. The London Midland sets have revised front ends with end gangways which make the trains look like the Electrostar family of units. From 1 September 2011, the units started operating on the Snow Hill Lines with some weekend work from Birmingham - Hereford. When first used in service, the units suffered a fault with engine vibration in the passenger cabin, which has since been rectified. Chiltern Railways has obtained four two-car trains in the same order as that of London Overground to supplement the current Class 165 Networker Turbos on its routes from London Marylebone, originally due to be delivered from late 2010. They do not have the tripcock safety system installed—unlike the rest of the Chiltern Railways fleet—as the design of the bogie being used (based on the B5005 found on Class 220 Voyager and Class 222 Meridian trains) means there is no place for the brackets to be mounted. Thus, they are not able to operate on the Aylesbury via Amersham line whilst the current signalling system is in place unless running in multiple with other units on both the front and rear ends, which are fitted with a tripcock. In late 2007 and early 2008, orders were placed with Bombardier by two rolling-stock leasing companies to purchase a number of Class 172 Turbostar trains. In December 2007, Porterbrook ordered 15 three-car and 12 two-car trains for London Midland for delivery in 2010. 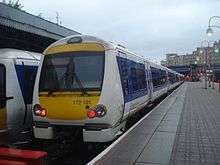 In January 2008, Angel Trains, on behalf of London Overground and Chiltern Railways, ordered 12 two-car trains for delivery, which would have been delivered during 2009. But difficulties over deliveries by Bombardier's suppliers led to delays in filling the Class 377 and 378 Electrostar orders, with subsequent knock-on delays for building the Class 172 sets. Work began at the end of 2009 after the freeing-up of one of Bombardier's production lines following completion of the Class 377 order for First Capital Connect. Eight 172/0 units have been built for London Overground. Testing of the first batch of new units, the 172/0 sets for London Overground, commenced in March 2010, with two sets (anonymous as they did not have unit numbers on them) being tested on the Old Dalby Test Track. All units have subsequently been delivered to Willesden Train Maintenance Depot (TMD). All eight 172/0 units have entered service for London Overground. These were originally restricted to a top speed of 40 miles per hour (64 km/h) as opposed to their intended design speed of 100 mph (160 km/h), as it was thought there was a fault with the exhaust system requiring modifications to the original design and the already procured units. It was expected that units for London Midland and Chiltern would be delayed by a further 6–12 months. However, it transpired that the exhaust emission testing had been flawed and that there were no major problems with the units or the original design. Production therefore continued as planned with a slight delay. The four Chiltern Railways units entered service during summer 2011. As part of its franchise agreement, London Midland has an option to purchase an additional 26 Class 172 vehicles which could potentially allow further cascade of its existing rolling stock. In 2008, First Great Western applied to the Department for Transport to re-equip its Cardiff to Portsmouth via Bristol services with 11 new four-car DMUs which would potentially allow the existing Class 158 Express Sprinter trains to be transferred to other services. According to the West of England Partnership, these were likely to be "similar to Class 170s", suggesting that they might be Class 172 Turbostars. The Government announced in December 2008 that Bombardier, with its Turbostar design, was one of the pre-qualified bidders (along with CSR of China, CAF of Spain and Rotem of South Korea) for the first 200 DMU vehicles of its planned 1300 new carriages. These new trains were intended for use on suburban and inter-urban services operated by First Great Western, First TransPennine Express and Northern Rail. However, with the announcement of the electrification schemes in the North West and on the Great Western Main Line, the DMU order was cancelled, with the needs of the train operating companies planned to be met by transfers of existing stock, though this eventually turned out not to be the case, and new trains were ordered by Northern and First TransPennine Express, though the manufacturer has not been revealed yet. Bombardier offered the Class 172 Turbostar to NI Railways for its "New Trains Two" specification, eventually losing out to CAF and a variation of NIR's existing Class 3000. The 172s on the Gospel Oak to Barking Line are due to be replaced by Class 710 Aventra electric units once electrification is completed in early 2018. ↑ "Porterbrook Class 172 DMU" (PDF). ↑ "London Midlands Class 172/3 DMU, 172331, 5Z72 Derby Litchurch Lane - Old Dalby". Published Railways Illustrated Issue March 2011. ↑ Gospel Oak to Barking improvement details. ↑ "New Plans". The Barking - Gospel Oak Line User Group. 1 2 Ford, Roger (December 2010). "Bombardier recovering from multiple-unit hiccups". Modern Railways. London. pp. 32–33. ↑ "The Underground Roundel moves Overground". Today's Railways (UK). Sheffield (70): 24–30. September 2007. ↑ "Green Light for Electric Trains at Last!" (PDF). Barking - Gospel Oak Rail User Group. ↑ "Bombardier to supply 69 Turbostar cars to Porterbrook Leasing in 129 million euro contract for the UK" (Press release). Porterbrook. 13 December 2007. Retrieved 5 July 2008. ↑ "London Midland launches £93m train fleet for Snow Hill line" (Press release). London Midland. 2 September 2011. ↑ "Angel Trains orders 'green trains' for the UK rail market" (Press release). Angel Trains. 31 January 2008. ↑ "Class 172s ordered". Today's Railways (UK) (74). Sheffield. January 2008. pp. 56–58. ↑ Photos of the class 172s under test Archived 13 September 2009 at the Wayback Machine..
↑ "Transport for London signs new train leasing contract" (Press release). Transport for London. 20 February 2008. 1 2 3 4 Clinnick, Richard (2009). "Britain's future-facing fleets". Rail (634). Peterborough. pp. 66–73. ↑ "East-West Rail Scheme, United Kingdom". Railway Technology. 2011. Retrieved 24 April 2012. 1 2 "Twenty seven new trains for London Midland" (Press release). London Midland. 13 December 2007. Archived from the original on 27 November 2010. ↑ "ROSCO Inquiry: DfT raises the stakes". Modern Railways: 25–26. November 2008. ↑ "Invitation to tender issued for 200 new diesel train carriages" (Press release). Department for Transport. 22 December 2008. ↑ Flanagan, Colm (2010). "Optimism in Northern Ireland". Modern Railways. 67 (737). pp. 60–64. Wikimedia Commons has media related to British Rail Class 172.